Tourism London is a partnership between several local London and provincial umbrella organizations to promote travel to the City of London. It’s aim is to highlight the events and attractions that draw visitors to the city, as well as the people and places that make travelling easier. Operating under the auspices of the municipal government, Tourism London has an annual budget of around $2 million; this is used both to promote the city and also to put in bids on big-ticket events that cities compete for. The first partner in Tourism London is, of course, the City of London. The City of London receives a decent revenue stream from tourism to city attractions and events, especially with the recent implementation of the city’s hotel tax. Attracting tourists to the city makes for good business, so it makes sense for the municipal government to commission an organization dedicated to bringing in more. The second partner is an organization called Downtown London. Downtown London is an organization that is really two local organizations rolled into one: the London Downtown Business Association and MainStreet London. The two organizations share similar board members, so their partnership is a natural fit to advocate for increased tourist attention to everything that downtown London has to offer. The two component organizations come at the goal from different angles. The London Downtown Business Association aims to represent the interests and concerns of the members of the Association, including the retention of businesses in the downtown core and the maintenance of the public-facing appearance of the downtown. MainStreet London, meanwhile, concerns itself primarily with continued improvement of the downtown core itself, a mandate that concerns both recruitment of businesses and other organizations as well as continued revitalization of the core to a more modern downtown that represents London as a city on the grow. The Downtown London partnership exists to administer the levy that downtown businesses pay toward the core’s upkeep in ways that benefit the economic, cultural, and educational development of downtown London. The third partner, London Is On!, is dedicated to promoting the cultural and entertainment events that are a big part of life in the city of London. Between the city’s numerous music venues, theatres, and the festivals that occupy the parks in the summer, there are a lot of events to promote to potentially interested parties outside of the city. The fourth partner, VIA Rail, is another natural fit for the promotion of tourism within the city of London. After all, an increased tourist trade in the city of London potentially means more traffic on VIA Rail trains that run through the city and can bring outside guests in to take part in the city’s various events and attractions. Given the price of gas and the time and cost involved in finding parking, taking the train in can be an attractive and affordable option for individuals or families looking to partake in everything that London has to offer. The fifth partner is Ontario’s Southwest. Ontario’s Southwest is the outward-facing façade of the Southwest Ontario Tourism Corporation, which is the provincially mandated Regional Tourism Organization for the region of Southwestern Ontario. This is an amalgamation of ten different local tourism management boards, including London’s. The goal is to promote Southwestern Ontario as a “vibrant and prosperous” tourism region. To do this, they focus their efforts on three main tourist areas: culinary tourism (including the region’s wine and craft beer manufacturers); waterfront tourism (which includes the region’s beaches, boating and fishing opportunities, and camping sites); and ‘significant event opportunities’, which include many of the festivals and cultural events across the region, especially those in the heart of the city of London. The SWOTC works with the tourism industry to conduct in-person and online training, 1-on-1 coaching, product development, market testing, and trend research, as well as an annual tourism conference. The SWOTC also offers guides and toolkits on how to start up future-ready tourist businesses and events, including craft breweries (co-written with the Ministry of Agriculture, Food, and Rural Affairs) and sustainable festivals. The sixth partner, the London Convention Centre, is (like the city itself and VIA Rail) another natural fit for promoting tourism. The London Convention Centre, located in the heart of downtown London, opened in 1993 to be London’s premier spot to host meetings, conferences, and exhibitions of all types. With 70,000 square feet of available space, and a culture that lends itself to flexibility in layout and customer service, the London Convention Centre can accommodate virtually anything, be it a small, purpose-driven meeting of a few people or a huge, decked-out gala for over a thousand people. The London Convention Centre is also run in a ‘green’ manner, with facility management working hard to reduce both waste and energy use. The desire of the London Convention Centre to attract and promote tourism to the city of London is obvious when you look at the numbers. In 2017, the economic impact of all of the meetings, conventions, and trade shows hosted at the London Convention Centre was in the realm of $17.8 million, big enough that it’s a vital part of both the city’s tourism industry and the city’s economy in general. The seventh partner is the Tourism Industry Association of Ontario, of which Tourism London is a member in good standing. The Tourism Industry Association of Ontario is, as the name implies, an umbrella advocacy organization that encompasses the Ontario tourism industry. It’s quite a large organization: covering 188,000 businesses and 391,000 employees, it uses it’s large, unified representation to work with the Ontario government to craft public policy that is sensitive to the needs of the tourism industry, and to provide a network wherein tourism businesses can work together to achieve growth and progress. Their advocacy work covers a number of different areas. First, they work to raise the profile and importance of the tourism industry not only with the government of the day, but also with the media and the public at large. They provide input on industry concerns and trends to the government of Ontario so that public policy can take these concerns and trends into account. They integrate with other tourism organizations, including local development organizations, to deal with issues of concern as they arise. They advocate for the investment of financial and other resources into the tourism industry by federal, provincial, and municipal governments, and they disseminate information to the businesses and organizations they represent dealing with updates and developments in the tourism industry as a whole. Tourism has played a vital role in the development and growth of Ontario as a whole. When Samuel de Champlain and subsequent French explorers came into Ontario, they kept carefully detailed notes on the variety of flora and fauna that they found in the region. This collection of newfound delights captivated the imaginations of people back in the Old World, leading in part to the increase in travellers coming over to the New World to observe, catalog, extract, and settle. Later, English explorers and early colonists would marvel over the natural wonders that Ontario has to offer. Mrs. Elizabeth Simcoe, wife of Lieutenant-Governor (and London founder) John Graves Simcoe, recorded a diary of her observations as she travelled with her husband during the time he was in charge of the government of Ontario. Much of her more poetic observations (and paintings) centered around the wild beauty of Niagara Falls, but descriptions of the bucolic lands around what became London are also in her diaries, and with good cause. In the beginning London was an agricultural colony, the kind of place that welcomed people sick of the squalor and fighting of Old Europe, British citizens looking to extend the power of the Crown into the New World, and those from the Thirteen Colonies who were less than enthused about the new American Republic. As the city grew over time, however, it began to develop the sorts of attractions that bring people from around the region to see and enjoy. 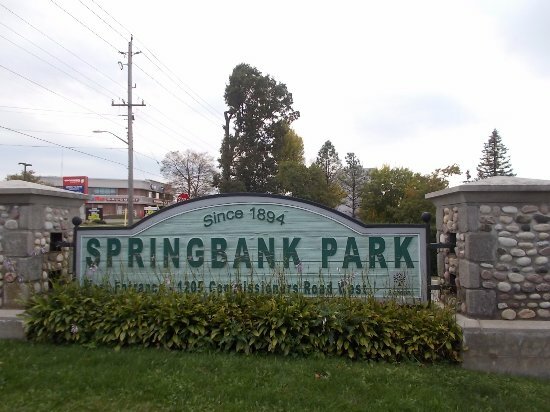 Near the end of the 19thCentury, the city of London developed it’s very own destination point with the growth in popularity of Springbank Park. In those days, what is today Springbank Park was known as Chestnut Park, and people came from all around the surrounding region to enjoy an afternoon of leisure there. Ferry service existed between the city and the park, and a hotel and refreshment stand had been built once it became obvious that people were consistently coming to the park to relax and play. Unfortunately, the park’s appeal and attendance dropped off from 1881 after the Victoria, one of the ferries that made it’s living servicing Chestnut Park, ran aground in the Thames River and capsized, killing 181 people. After that, Chestnut Park ceased to be a tourist draw, but in 1914 the Victor Amusement Park opened in Springbank Park and London again had a tourist destination. The Victor Amusement Park featured a zoo and campground to begin with, but quickly added a carousel, a roller coaster, paddle boats, mini cars, bowling, a ferris wheel, bumper cars, a fun house, and a penny arcade. It became a big tourist draw for the city and succeeded until the outbreak of the Second World War; while the park managed to survive the Depression, the patriotic need to conserve resources and ‘get to work’ meant sacrificing attendance at perceived frivolities like amusement parks. In 1958, the idea of an amusement park in Springbank was revived with Storybook Gardens, a child and family-centered amusement park that continues to bring in guests from all over today. Another traditional tourist draw for the city of London has been organized sports. London is home to the oldest continually occupied baseball diamond in the world, Labatt’s Park. Organized baseball is something that Americans like to claim as their own, but it really got it’s start in southern Ontario. London and the nearby little town of Beachville have a rivalry over where it reallygot started but regardless of where, the fact is by the late 19thCentury organized baseball games brought outside teams and their fans into London to watch them play. This has continued in greater or lesser form since then, depending on the level of the team operating out of London. As an example, the years 1989 to 1993 held a greater level of sports tourism, since London’s local team, the AA level London Tigers, were a farm team of the major league Detroit Tigers organization. In the modern era, it’s typically hockey fans that bring the largest amount of sports tourism to the city. OHL travellers come from around Ontario to watch their teams play the London Knights at the Budweiser Gardens downtown; many of them stay in hotels and spend large amounts of money at downtown establishments before and after the game. One of the biggest draws for London tourism during the year are the various events and festivals that are held. London has become a major contender for national events in recent years, hosting such gatherings as the CCMA Awards, the Country Music Association of Ontario Awards, and the nationally watched JUNO Awards. Big ticket events like these are part of the reason for Tourism London’s existence: getting a bid in on these requires large amounts of paper work and some hefty entry fees, which the organization navigates on behalf of the city. In addition, annual events and festivals continue to be big draws for tourist dollars in London. The Western Fair is probably the best well-known of these, bringing in people from all over Ontario and elsewhere to partake in the rides, foods, exhibitions, and concerts that the Western Fair has on offer. Beyond the Western Fair, though, there are annual events like Sunfest (the second largest outdoor world music and jazz extravaganza in Canada), the Rock The Park festival (which draws in big names of all genres to perform), the Home County music festival (which brings in country lovers from Ontario and the northern United States), London Bluesfest (an annual mixture of the blues and classic rock), the London Ribfest and the Forest City Beer Fest (an exposition of the best food and drink on offer around the city), and Fringe Festival (which presents the cutting edge of theatre, music, and film). Tourism London has all of these details and more. They’ll also help you find a hotel room for your overnight stay, so don’t hesitate to start exploring all of the wonders that the City of London has to give you.